Before there was Facebook or any other online "casting" networking resource, there was Hollywood OS®, established in 1997. 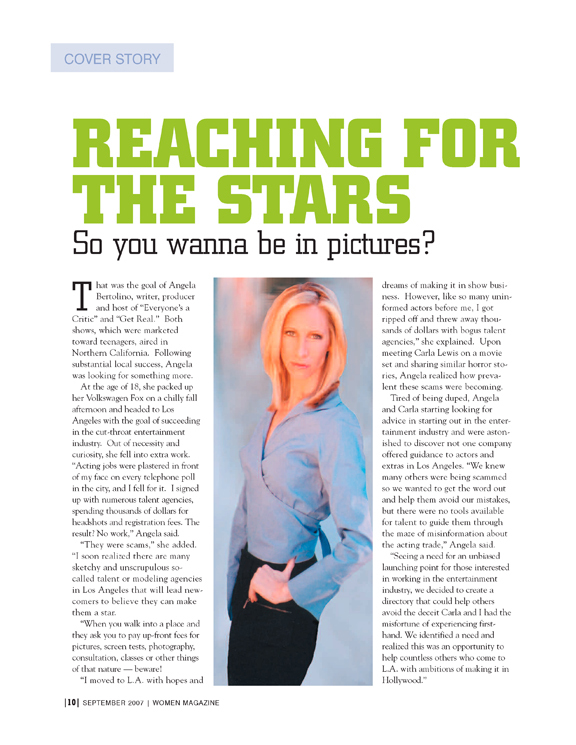 At the age of 18, Angela moved to Los Angeles with a dream and fell into Hollywood scams. At 21, she created the innnovative Hollywood Operating System® platform by connecting casting directors to talent, revolutionizing the entertainment industry. Angela is also the author and publisher of best-selling book "EXTRA" WORK for Brain Surgeons® and KIDS' ACTING for Brain Surgeons®. 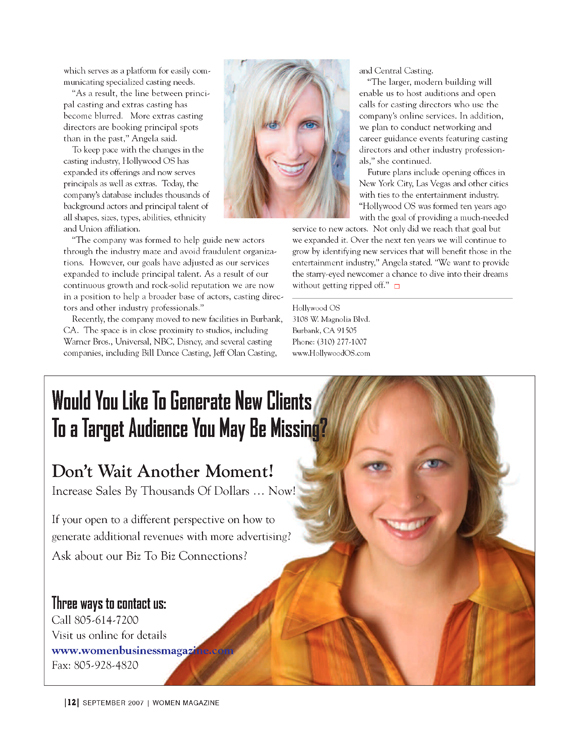 Check out Angela Bertolino profiled as the Cover Story in the September 2007 issue of the highly esteemed publication Women Business Magazine. 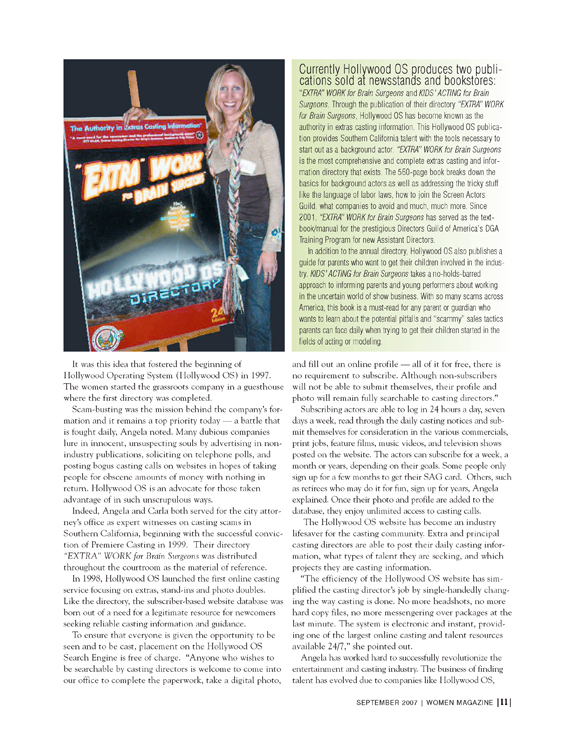 • The evolution of the Hollywood OS® and why it was founded. • Why scam busting continues to be top priority, more than 13 years later! • The latest publication receiving rave reviews, KIDS' ACTING for Brain Surgeons®. We appreciate your input, so let us know what you think. As always, thanks for your continued support! Click to download the entire Women Business Magazine article in PDF format.